Right now, I am fighting within myself. I’m battling the symptoms of my mental health diagnosis. I’m arguing with myself and the voices I hear that nobody else hears. See, one of the diagnosis I have is Major Depressive Disorder (MDD) with psychotic features. That means when my depression act up I hallucinate. Actually, I have what they call auditory hallucinations which means I hear things that nobody else hear and aren’t real. 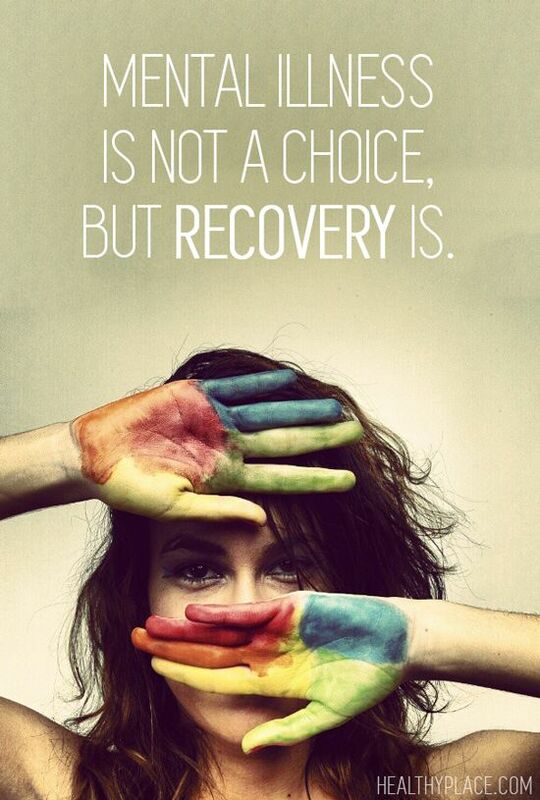 I’m telling you this as I don’t choose to have a mental health condition/challenge but I do choose to be in recovery. I may not being doing well at the moment however, I am choosing to fight against the urges to self harm and what the voices are telling me to do. My voices are encouraging me to act on the urges to self harm. I of course am NOT going to act on the urges or what the voices are encouraging me to do. I am choosing to NOT act them because I have the tools (or skills) to help myself. To help myself to NOT self harm by using Dialectical Behavior Therapy (DBT) skills. Using the DBT skill I’ve learned over the last fourteen years is what has saved my life. It’s what has helped me start my recovery and remain in recovery despite set backs or “relapses.” I choose get back up and wipe the dust off when I do relapse in self harm behavior. In fact when I realized that my self harm urges were high and that the voices were encouraging me to act on them, I contacted my treatment team to help me through. The person who helped gave me some encouragement as well as some suggestions they know that helps me. One of those suggestions was (and is) blogging. However, before I chose to take the persons suggestion to blog, I did a couple of other suggestions first so I could blog in a better head space. I first ate something and then I went for a three mile walk. After eating and going for a walk, it put me in a better head space to be able to write this blog post. In fact blogging is helping me at the moment however, I am going to go do other DBT skills now. So, yes that means I will be ending this blog post. FYI: I AM CURRENTLY NOT DANGER TO MYSELF OR ANYONE ELSE. (In fact I’ve NEVER been a danger to anyone else.) I hope everyone has a good rest of their day. Peace Out, World!!! It’s two o’clock in the morning on Monday, October 16th of 2017. This particular blog post is not going to be a pretty one. It’s not going to be a pretty one because, I’m not only going to be discussing what happened on Saturday night but showing you images. IMAGES THAT ARE QUITE GRAPHIC!!! Saturday night was not the most pleasant of days for me. Both my PTSD and Depression symptoms got the better of me. So much so that I ended up cutting myself. I scared myself so much by cutting myself that I called two close friends who took me to the hospital to get evaluated. I would have called Junior however he was working at the moment and didn’t need him to worry as he is a firefighter. As I was stating my friends took me to the Emergency Room where my wounds got treated and I got evaluated for my state of mind. Everyone was in agreement that I could (and still can) remain safe and was able to return home. I stayed with my friends till Junior got off work. He picked me up from my friends house. He looked at my wounds and redressed them. We discussed on what I could do the next time things go this bad. Next time I won’t be so hesitant to reach out for support of friends are so fearful of calling 911. Part of the reason why I ended up cutting on Saturday night was because I was fearful of my symptoms and angry that I was having them. I did end up getting some stitches. You may or may not be able to see the stitches but wanted to fore warn you. I just want to show you the realities of what happens when I am in an extremely bad head space. This is why I am grateful that I have a great support system. I am beyond grateful that I have a loving partner and awesome friends who are in my corner. Thank you for reading my blog. I truly apologize if I triggered anyone with this particular blog post. Again, I want to reiterate: I AM NOT CURRENTLY SUICIDAL AND I DON’T WANT TO HARM MYSELF IN ANY WAY. I’M NOT A RISK OF HARMING MYSELF OR ANYONE ELSE. Again, I want to thank for reading my blog. I hope I didn’t trigger anyone. If I did, I truly do apologize. I hope everyone has a good Monday. Have a good work week everyone and Peace Out, World!!! It’s been a long day and continues get longer. I, of coursed worked today and now I am waiting to start a Warm Line shift. I decided that I would fill in for someone who needed to take the day off from their shift. Others have done it for me so I will do it for others. I know I’m going to be tired by the end of my volunteer shift since I worked today as well but I am looking forward to tomorrow. I am looking forward to tomorrow because at this time tomorrow I will be getting my second tattoo. I am going to be getting a butterfly on my right shoulder. I emailed an idea of the butterfly tattoo I desire to my tattoo artist informing him that the image I sent him was an idea of how I want the butterfly and would like his artistic style to the butterfly as well. From my understanding he is grateful for the idea and is “thrilled” to be able add his own style to the butterfly tattoo I emailed him. It was and is just an idea of how I would like the idea. The placement of my tattoo will be covering up some scars on my shoulder. Scars that people always assume that are “fresh” when they are not. They just happened to be keloid scars. If you regularly read my blog you know that I have had issues with cutting myself in the height of my mental illness. It seems that all the tattoo’s I plan on getting including the one I have and the butterfly I am getting tomorrow all have some meaning to me in regards to my mental illness. Most if not all I am going to get will be recovery related. 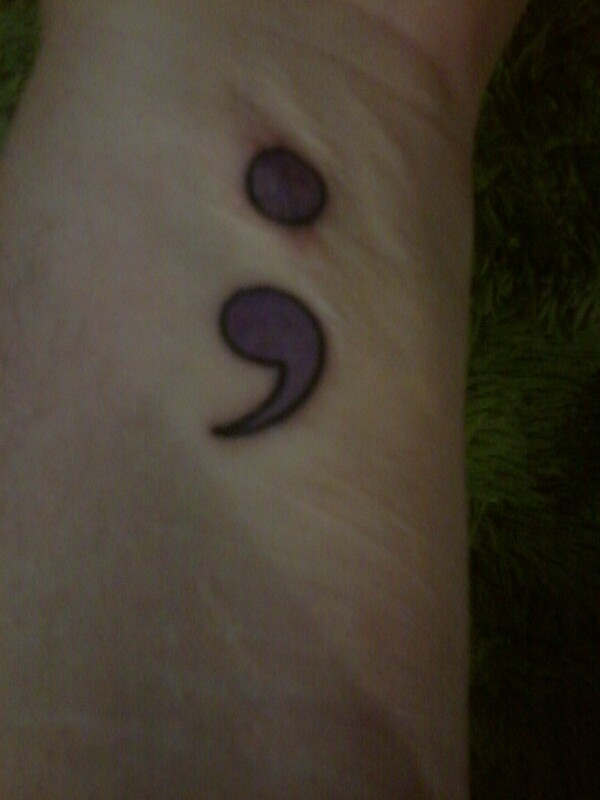 Two or three will help bring awareness to mental illness like the semi-colon tattoo I already have. The butterfly has meaning to me as well and yes it involves my recovery dealing with mental illness. I will share with you the meaning behind it, tomorrow evening or Saturday morning when I do my weekly check in. Hell, I might just do an entire post on just my new tattoo after I get it. Yes, I will put up a picture of it on my blog. I need to get going. My Warm Line shift is about to start. Have a wonderful evening. I hope to do another post tomorrow evening, weather it’s my weekly check in or about my butterfly tattoo. Peace Out!!! In response to The Daily Post’s writing prompt: “Tattoo….You?.” Do you have a tattoo? If so, what’s the story behind your ink? If you don’t have a tattoo, what might you consider getting emblazoned on you skin? I just wanted to share with you all my first tattoo. In fact I got it yesterday, Friday, October 30, 2015. I got the semi-colon for a multitude of reasons and all of them are in regards to mental health. As some of you may or may not know that there is a project out there call Project Semi-Colon. It was created, if I’m not mistaken, to bring awareness to the stigma of cutting even in the mental health world. It was also created to bring awareness to those who deal with depression, anxiety and other such mental health diagnoses as well as those who lost their life to suicide. Another thing is that life is similar to a semi-colon; A semi-colon is used when a sentence could have been ended but wasn’t. I personally got the semi-colon to remind myself how far I have come in my recovery and how many times I could have ended my life. In fact I have tried to take my life on many different occasions yet those attempts weren’t successful. Thankfully those attempts were intercepted by a semi-colon because clearly my story isn’t over. It isn’t over because I can share my recovery story with others. My story isn’t over because I can discuss how my life has been affected by mental illness to not only help others but to help lessen the stigma of mental illness. Now on to why I chose the color I did. As you can tell from the picture my semi-colon tattoo is outlined in black and in filled in with purple. The purple has special meaning to me. When I was struggling a few years back my therapist reminded me to not think in black or white but shades of gray. I informed her that shades of gray weren’t exactly easy to do because it was gray out and it was depressing. She then suggested white and red would come up with shades of pink and she quickly remembered I’m not exactly a pink kind of woman. I then came up with red and blue which make purple. Long story short the purple is to help me think in shades of gray but only in color. Purple also has other meanings to me. As you can tell, I basically got the semi-colon tattoo to help start a conversation about mental health issues. If just one conversation about my tattoo helps lessen the stigma with mental illness then it’s done its job. Thank you for reading. Have a good day. Stay safe out there today and have fun. Happy Halloween. I realize it is Saturday and that I forgot to do my Friday Feature on educating you all. I apologize for it being late. I have decided to get the info from Mental Health America at: http://www.mentalhealthamerica.net/self-injury I have decided to do cutting and other self harm. Self-injury, also known as cutting or self-mutilation, occurs when someone intentionally and repeatedly harms herself/himself. The method most often used is cutting but other common behaviors include burning, punching, and drinking something harmful, like bleach or detergent. It’s estimated that about two million people in the U.S. injure themselves in some way. The majority are teenagers or young adults with young women outnumbering young men. They are of all races and backgrounds. Often, people say they hurt themselves to express emotional pain or feelings they can’t put into words. It can be a way to have control over your body when you can’t control anything else in your life. A lot of people who cut themselves also have an eating disorder. Although they usually aren’t trying to kill themselves, sometimes they’re unable to control the injury and die accidentally. How can I help a friend with this? Ask about it. If your friend is hurting herself, she may be glad to have you bring it up so she can talk about it. If she’s not injuring herself, she’s not going to start just because you said something about it. Offer options but don’t tell him what he has to do or should do. If he is using self-injury as a way to have some control, it won’t help if you try to take control of the situation. Helping your friend see ways to get help – like talking to a parent, teacher, school counselor or mental health professional- may be the best thing you can do for him. Seek support. Knowing a friend is hurting herself this way can be frightening and stressful. Consider telling a teacher or other trusted adult. This person could help your friend get the help she needs. You may feel that you don’t have the right to tell anyone else. But remember, you can still talk to a mental health professional about how the situation is affecting you, or you can get more information and advice from any number of organizations. Remember you’re not responsible for ending the self-abuse. You can’t make your friend stop hurting himself or get help from a professional. The only sure thing you can do is keep being a good friend. Know that help is available. Treatment is available for people who injure themselves. To learn about it, try talking to a professional person around you, someone like your school counselor. If you’re not comfortable with that, think about contacting your local mental health association or checking out the S.A.F.E Alternatives website. Know you are not alone. Because so many people are self-injurers, it’s likely that there are people around who can understand and can help. Know you can get better. This is a difficult time in your life. However, with help, you can get to the point where you don’t hurt yourself anymore. Get help. Now is the best time to get help with this problem. If you wait, the problem will only get bigger and soon everyone will know about it. But if you find a way to meet it head on today, you’ll be free of it and free to get on with your life. Free! A good way to be. Self-Injury is also termed self-mutilation, self-harm or self-abuse. The behavior is defined as the deliberate, repetitive, impulsive, non-lethal harming of one’s self. Self-injury includes: 1) cutting, 2) scratching, 3) picking scabs or interfering with wound healing, 4) burning, 5) punching self or objects, 6) infecting oneself, 7) inserting objects in body openings, 8) bruising or breaking bones, 9) some forms of hair-pulling, as well as other various forms of bodily harm. These behaviors, which pose serious risks, may by symptoms of a mental health problem that can be treated. Warning Signs. Warning signs that someone is injuring themselves include: unexplained frequent injury including cuts and burns, wearing long pants and sleeves in warm weather, low self-esteem, difficulty handling feelings, relationship problems, and poor functioning at work, school or home. Incidence & onset. Experts estimate the incidence of habitual self-injurers is nearly 1% of the population, with a higher proportion of females than males. The typical onset of self-harming acts is at puberty. The behaviors often last 5-10 years but can persist much longer without appropriate treatment. Background of self-injurers. Though not exclusively, the person seeking treatment is usually from a middle to upper class background, of average to high intelligence, and has low self-esteem. Nearly 50% report physical and/or sexual abuse during his or her childhood. Many report (as high as 90%), that they were discouraged from expressing emotions, particularly anger and sadness. Behavior patterns. Many who self-harm use multiple methods. Cutting arms or legs is the most common practice. Self-injurers may attempt to conceal the resultant scarring with clothing, and if discovered, often make excuses as to how an injury happened. Reasons for behaviors. Self-injurers commonly report they feel empty inside, over or under stimulated, unable to express their feelings, lonely, not understood by others and fearful of intimate relationships and adult responsibilities. Self-injury is their way to cope with or relieve painful or hard-to-express feelings, and is generally not a suicide attempt. But relief is temporary, and a self-destructive cycle often develops without proper treatment. Dangers. Self-injurers often become desperate about their lack of self-control and the addictive-like nature of their acts, which may lead them to true suicide attempts. The self-injury behaviors may also cause more harm than intended, which could result in medical complications or death. Eating disorders and alcohol or substance abuse intensify the threats to the individual’s overall health and quality of life. Diagnoses. The diagnosis for someone who self-injures can only be determined by a licensed psychiatric professional. Self-harm behavior can be a symptom of several psychiatric illnesses: personality disorders (esp. borderline personality disorder); bipolar disorder (manic depression); major depression; anxiety disorders (esp. obsessive-compulsive disorder); as well as psychoses such as schizophrenia. Evaluation. If someone displays the signs and symptoms of self-injury, a mental health professional with self-injury expertise should be consulted. An evaluation or assessment is the first step, followed by a recommended course of treatment to prevent the self-destructive cycle from continuing. Treatment. Self-injury treatment options include outpatient therapy, partial (6-12 hours a day) and inpatient hospitalization. When the behaviors interfere with daily living, such as employment and relationships, and are health or life-threatening, a specialized self-injury hospital program with an experienced staff is recommended. The effective treatment of self-injury is most often a combination of medication, cognitive/behavioral therapy, and interpersonal therapy, supplemented by other treatment services as needed. Medication is often useful in the management of depression, anxiety, obsessive-compulsive behaviors, and the racing thoughts that may accompany self-injury. Cognitive/behavioral therapy helps individuals understand and manage their destructive thoughts and behaviors. Contracts, journals, and behavior logs are useful tools for regaining self-control. Interpersonal therapy assists individuals in gaining insight and skills for the development and maintenance of relationships. Services for eating disorders, alcohol/substance abuse, trauma abuse, and family therapy should be readily available and integrated into treatment, depending on individual needs. In addition to the above, successful courses of treatment are marked by 1) patients who are actively involved in and committed to their treatment, 2) aftercare plans with support for the patient’s new self-management skills and behaviors, and 3) collaboration with referring and other involved professionals. I’m sorry for it being so long. Thank you for reading. Have a wonderful weekend and Peace Out!!! As you can tell many of my poems come real life. My life. My life of living with a mental illness and how poetry plays a major part of my recovery process. Poetry comes naturally to me and find it frustrating when I have to spend thirty minutes on one. No the above poem didn’t take me thirty minutes do but yesterdays took me that long. It usually takes me about five to fifteen minutes to create a poem. I love writing poem because it therapeutic for me. Thank you for reading. Have an awesome weekend.